High capacity of 420 lbs / 200 kg. Determination of small fluctuations in weight thanks to fine graduation of 1/8 lbs / 50 g.
Generously sized platform with non-slip surface. Tough and easy to operate. Increased capacity and fine graduation - At 420 lbs, the capacity of the new seca 710 is higher than that of its predecessor. It is thus suitable for weighing heavy patients. At the same time, the sensitive mechanics of the scale mean that even the smallest fluctuations of 1/8 lbs can be determined. This sensitivity predestines the scale for weighing children, dialysis and other patients. All dimensions optimised - The waist-level beam is a positive feature which, for example, makes it easier to weigh pregnant women. The large tread area is not only especially low and thus easy to mount but is also fitted with a nonslip rubber mat. Together with the fine graduation of 1/8 lbs, this is an additional advantage for safe weight control also in the gynaecology sector and in nutrition consultation. Tough and easy to operate - As far as toughness is concerned, the seca 710 can hardly be surpassed: its cast-iron base, the steel column and the special antirust coating of the lever apparatus guarantee a long life. The graduation printed on the beam is easy to read at a glance due to the clearly contrasting colours. 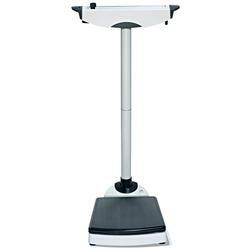 Thanks to the integrated transport castors, the scale can easily be moved anywhere. Adjustment to the zero position is especially userfriendly: the scale is adjusted with an easy to use tare wheel – for constant precision. Weighing and measuring in one step, with the optional measuring rod seca 220 - Precision weighing and measuring in one step – by attaching the optional measuring rod seca 220 one can convert the seca 710 into a time-saving solution for both the surgery and the hospital when both values are required.